If they were giving out tardiness badges to bloggers I’d be up there in the front of the queue. 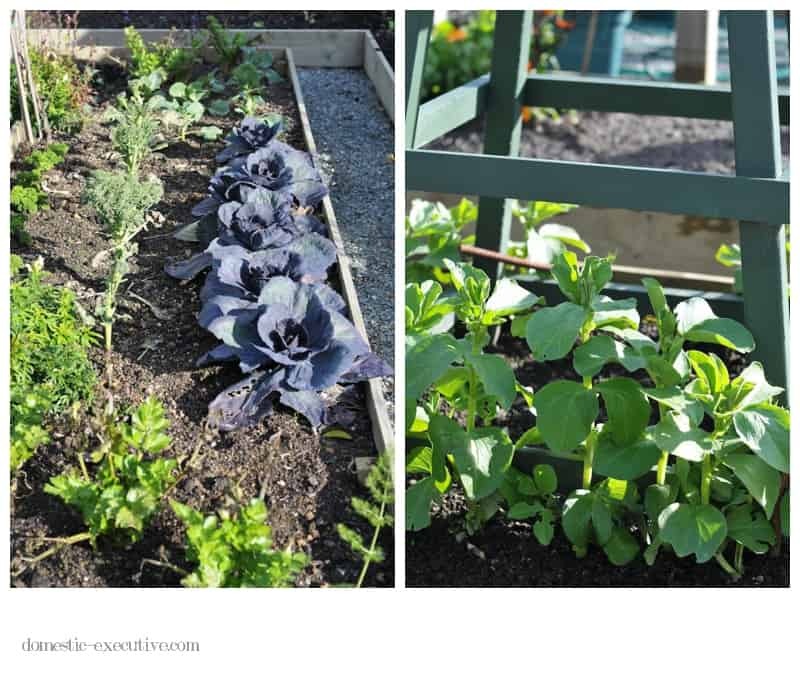 Carefully crafted in my head, this blog post was planned to celebrate one of my favourite garden rituals, the annual planting of the garlic. But, such great thoughts of creativity were rudely interrupted by another force of nature that had Wellingtonians dancing the proverbial earthquake hokey cokey. Although the forces of gravity were a mere shrug to the Christchurch earthquake of two years ago on Sunday 17 July at 17:09 we had our very own 6.5 richter shake. This sparked its own comedy with me simultaneously hugging one basset whilst rugby tackling the other intent on chasing the invisible intruder whilst shouting @m_treanor to catch my prized china penguin that waddled precariously close to the edge of the shelf on which it sat. The shaking stopped as abruptly as it started but then came the tsunami of tweets from fellow Wellingtonians who clung to doorways, took a medicinal dram sitting under a table and reports of motion sickness from swaying in high rise apartments. Such earthly high jinx blew a hole through our evening. Plans for a leisurely Sunday evening of chores and blogging were overtaken by an adrenaline pumped frenzy of unearthing earthquake survival packs, rounding up highly prized fragile items for safe keeping and stowing kitchen appliances for fear of a Kenwood mixer falling off the bench down onto the bassets’ heads. In such times calming measures are required so @m_treanor was put to work making fennel risotto in the hope that the constant stirring would be adequate distraction from the repetitive TV footage of shaking and cracked buildings that makes you hyperventilate if you watch it for too long. Post quake engineers flooded into the Wellington and Marlborough regions to check buildings, rectify breakages and restore core public services. Some might say it was a gross over reaction but I’m all for erring on the side of caution. Interestingly whilst most buildings in Wellington stood up to the quakes pretty well it seems even some of the newest buildings had their internal fittings trashed with broken ceilings and water pipes or activated water sprinkler systems causing much damage and mess. Wellington was up and running for business again within 24 hours although the coffee shops won the race to trade again and maintain almost continuous service to fuel the Capital’s coffee habit. If you are ever in some sort of public drama you can’t beat being surrounded by New Zealanders. Their laid back and no-nonsense approach to life can lighten the mood of even the darkest hours. I am always comforted by the black humour from our geoscientists who monitor and report on earthquakes bringing a human touch to what is otherwise a mass of scientific data. For all the naysayers of social media such as twitter there are real people behind those twitter feeds that reply to each tweet that they receive from curious followers. Admittedly I’m biased because I do work for GNS and they are some of the brightest people totally committed to understanding how and why the earth works in these mysterious ways. As the after shocks continue to roll in like waves lapping on the shoreline we have all returned to normal life if a little distracted and jumpy at every bump and rumble that passes by. Thankfully nature boosted morale further by bringing blue skies and sunny days making winter seem like an abstract notion hard to associate with. Perfect weather for starting to get stuck into the planting of garlic and clearing out the kitchen garden ready for the upcoming growing season. 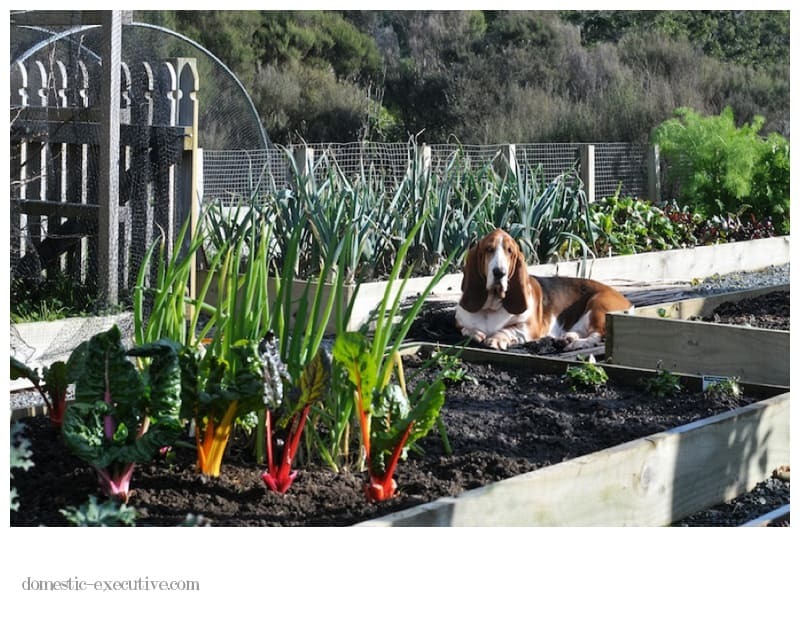 Perfect too for a spot of basset sun bathing as the hounds kept a watchful eye on my every move playing more an ornamental than productive role but bringing a sense of calm, normality and simplicity to life. Just the way I like it most. 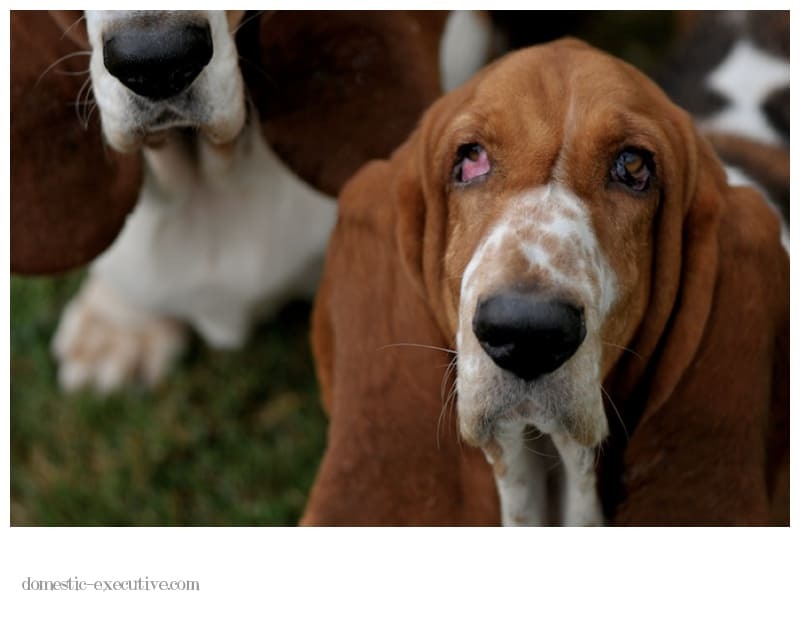 It’s not like I didn’t spend hours training our basset hounds in basic dog etiquette. You know the usual commands of “sit, lie, come, stay, off, no, leave.” Trouble is that the trainer recommended food as the training incentive which in hindsight was probably the dumbest thing you could do for an extraordinarily food motivated breed of dog. 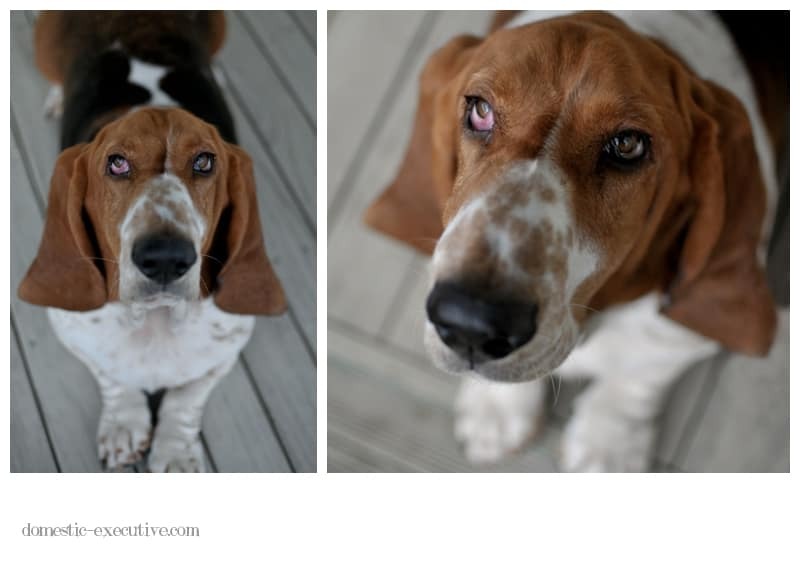 A basset hound would do anything for anyone if you have food in your hand. 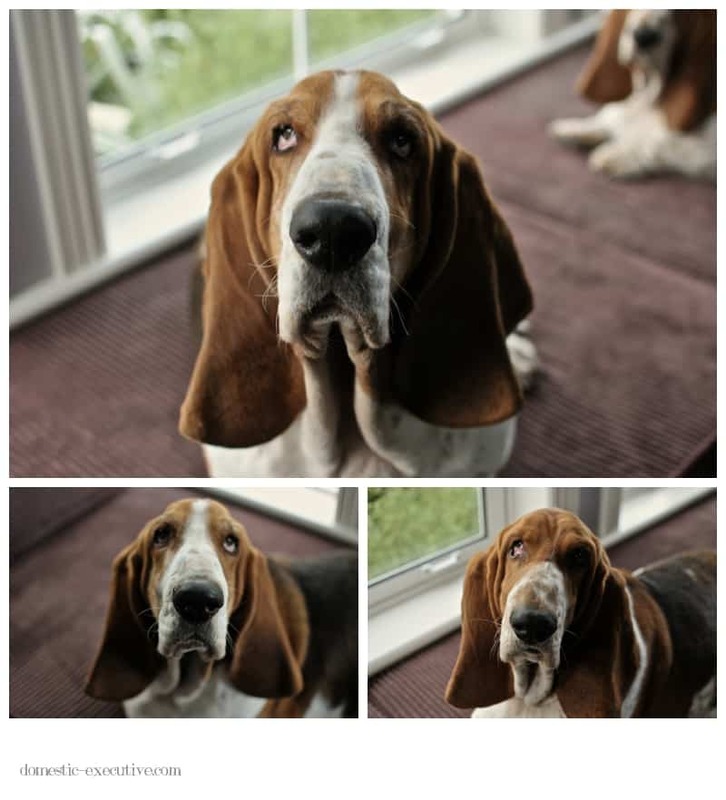 Food is probably the only thing in the world that makes a basset give you their undivided attention. 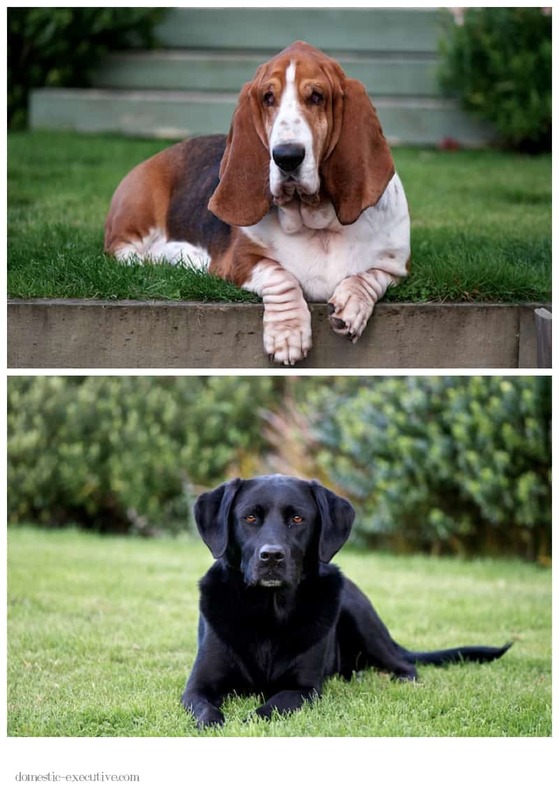 I was experimenting to see if using a few treats might improve the chances of getting the bassets to sit nicely for a photographic portrait session. Unfortunately it had the effect of turning their faces rigid and their eyes demonic as if the food was taking over their personas. 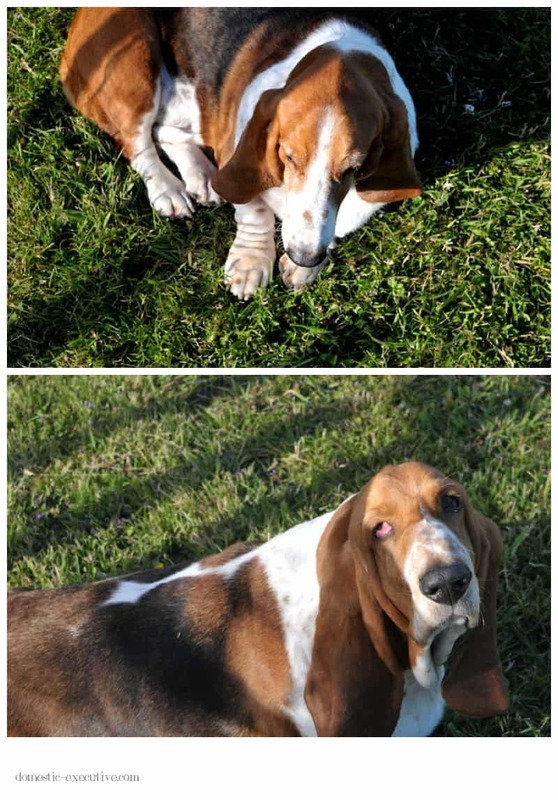 Which is of course exactly what happens to a basset where food is concerned, as long as it is the right sort of food. 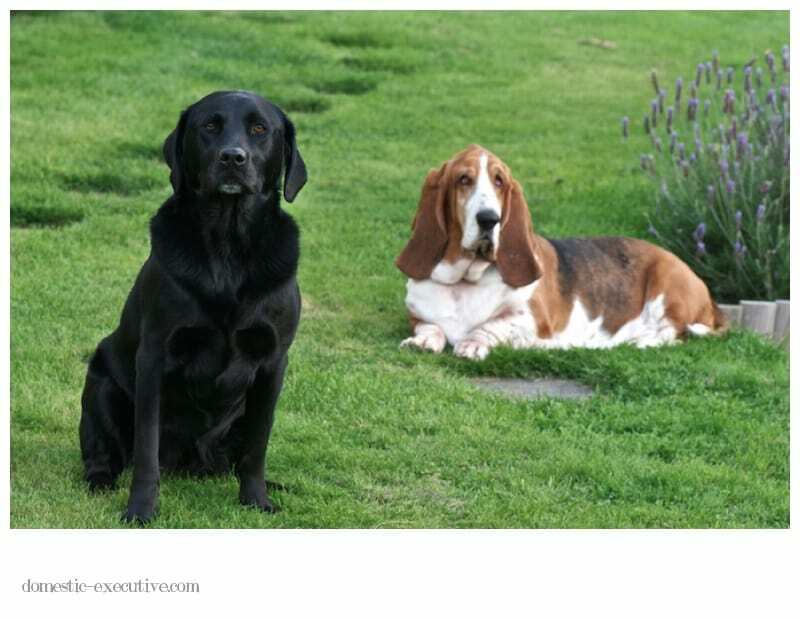 These are smart dogs and they are not content with their usual dog food biscuits. They will only perform for higher value gourmet treats such as a piece of sausage, cheese or perhaps a sirloin steak. 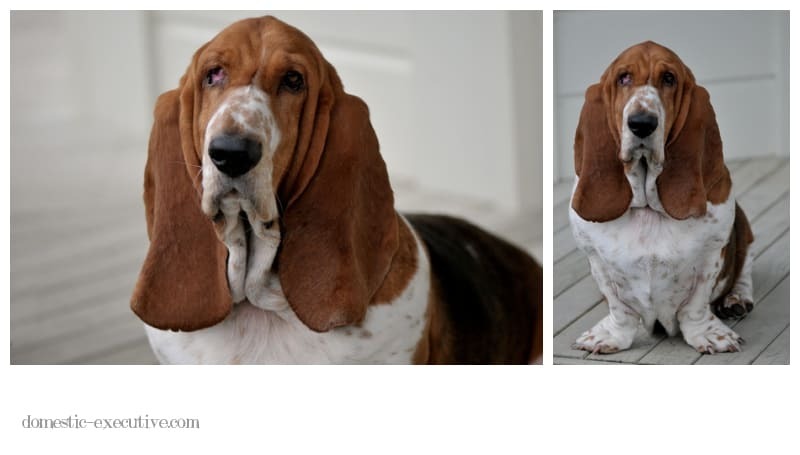 I have spared you the full horror of such indulgence as faced with such treats a basset will start to salivate which can be a messy affair. 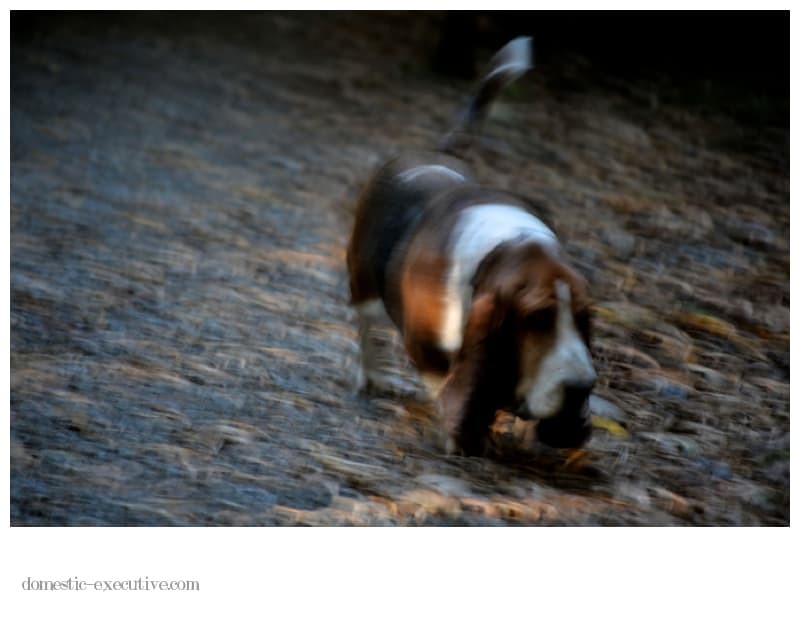 It is only a matter of a few minutes before you have to take cover from a basset that will dispose of excess slobber by centrifugal force and you (and your camera lens) will be in the firing line of a high speed basset head shake. 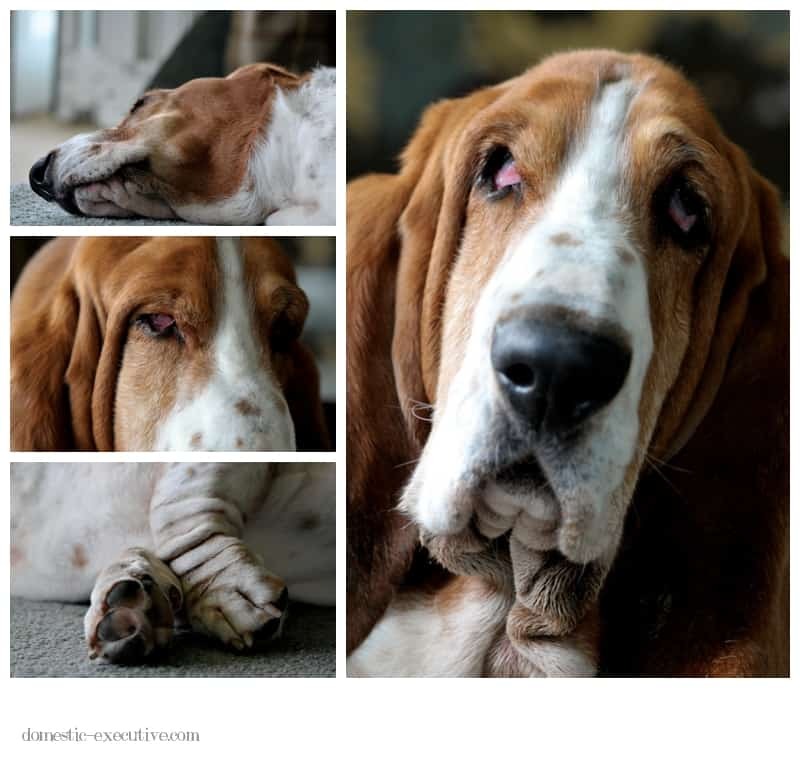 For all it’s frustrations I think I shall stick to photographing the hounds in their natural state and hope for a momentary flash of love and charm amongst the bored and dismissive looks. 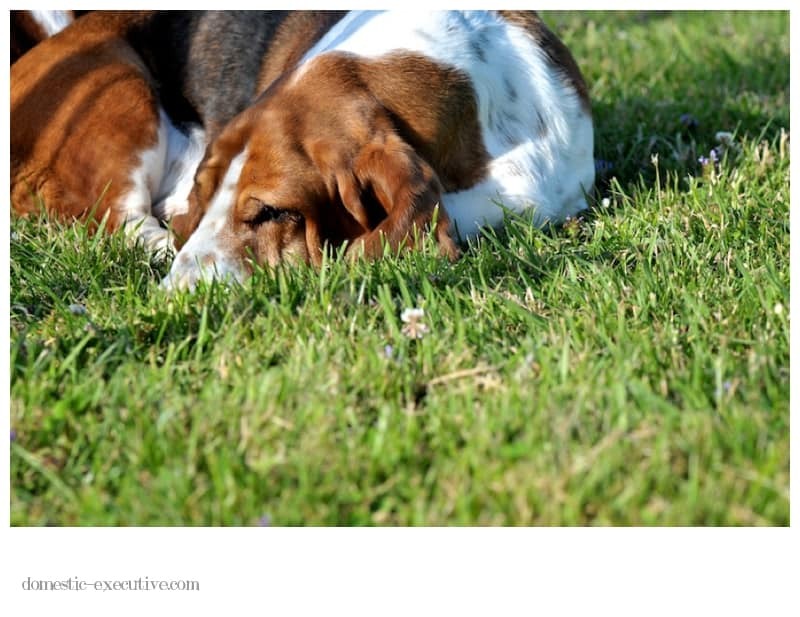 Food may get their attention but Its just not natural for a basset to be that cooperative or obedient. Having a canine guest always opens my eyes to animal behaviour I’m unfamiliar with. 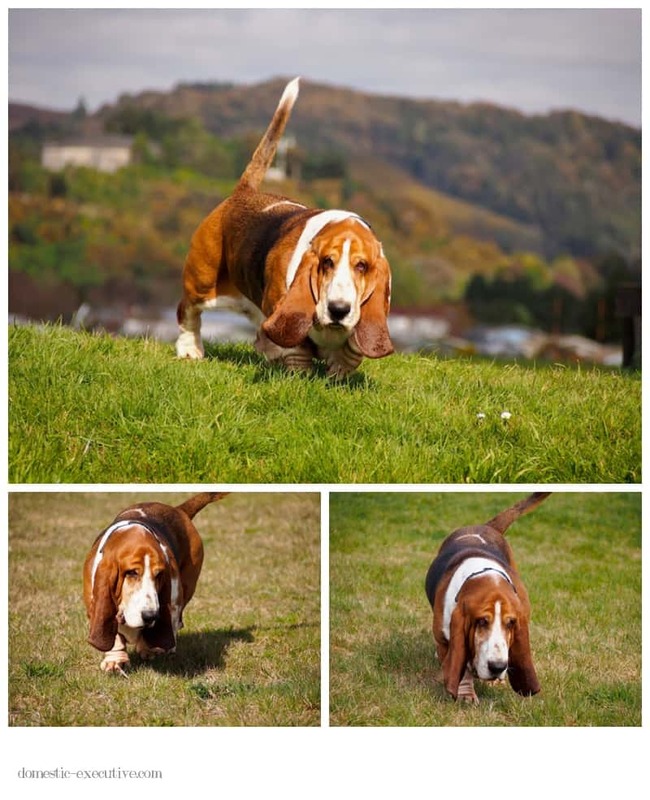 That eager to please, what can I do to make you happy attitude missing from life with basset hounds. Spend a few days with a Labrador and you get to know the true meaning of a loyal canine friend. 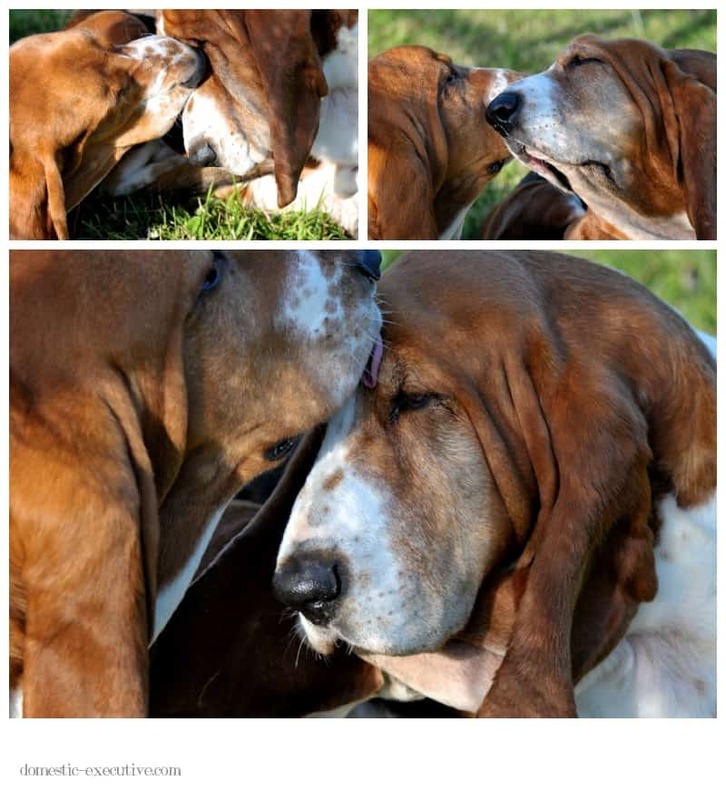 Friendship with a basset hound is a battle of wills and constant negotiation of power and reward. Generally this is their power and reward. 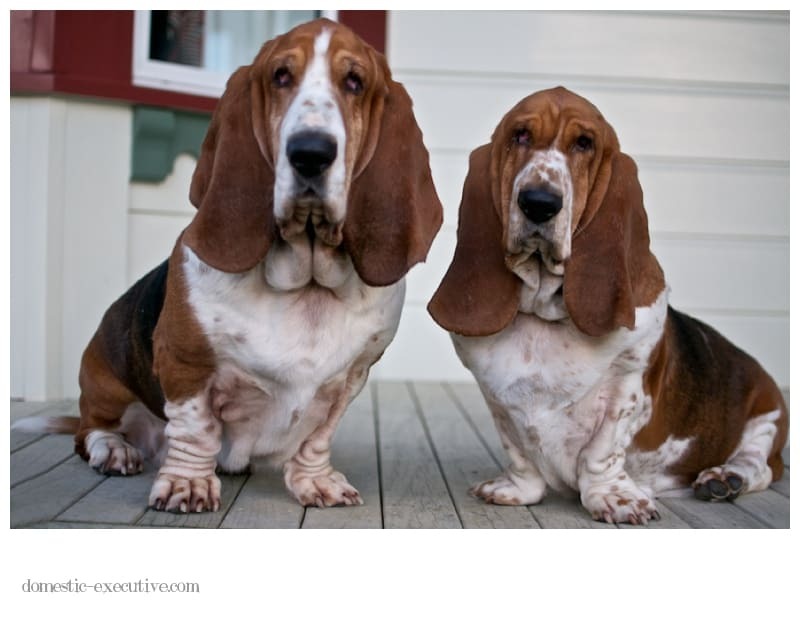 Even at their most obedient our hounds barely lower their seats or undercarriages before snatching their rightful treat from our hand. You only need to flick through the photographs below to see their characters on show. 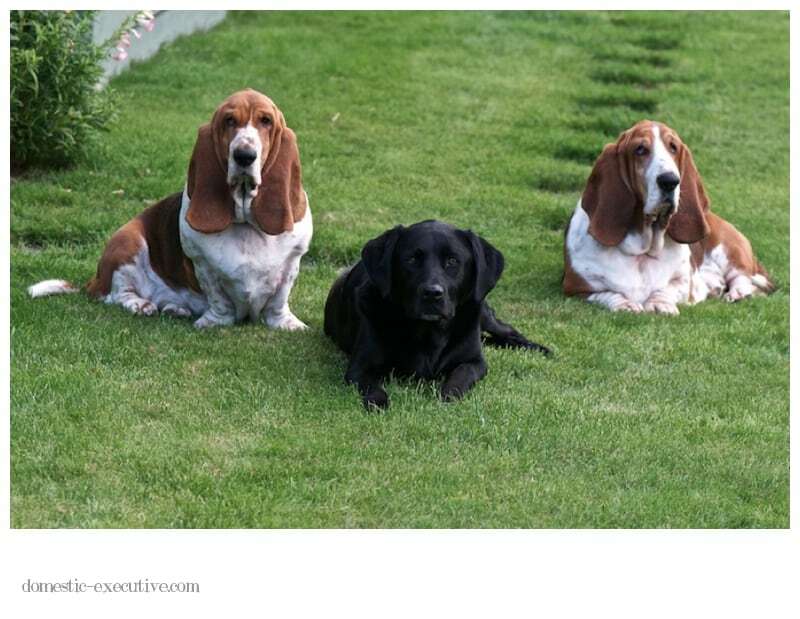 Abby, the labrador is attentive to your every command whereas the bassets have a fleeting moment of interest just in case there is something worth paying attention for. 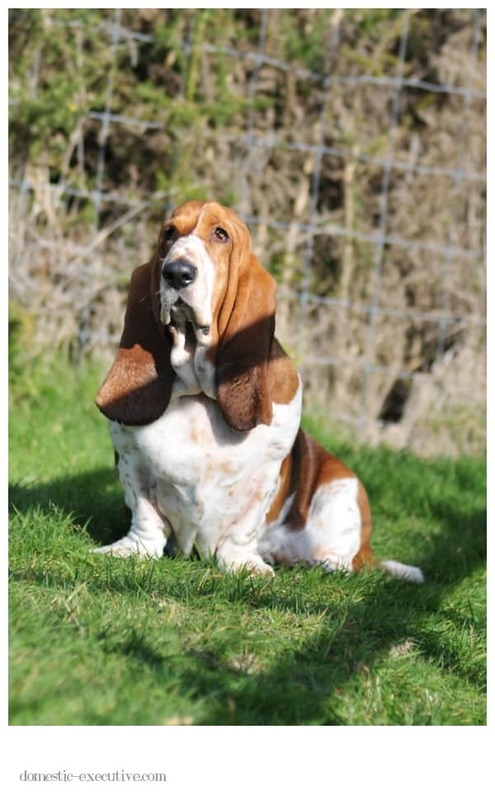 If you want a dog who will be your obedient and loyal companion don’t disappoint yourself by bringing basset hounds into your life. 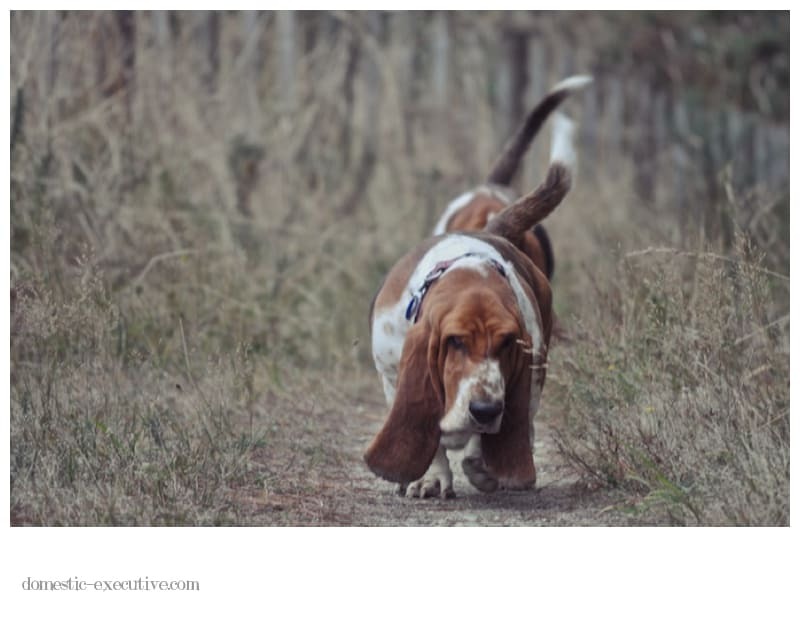 Hounds are fiercely independent minded and strong-willed that know their cute faces and idiosyncratic ways will paralyse your rational senses to leave you at their beck and call and make you their loyal servant. Strangely, I wouldn’t have it any other way. 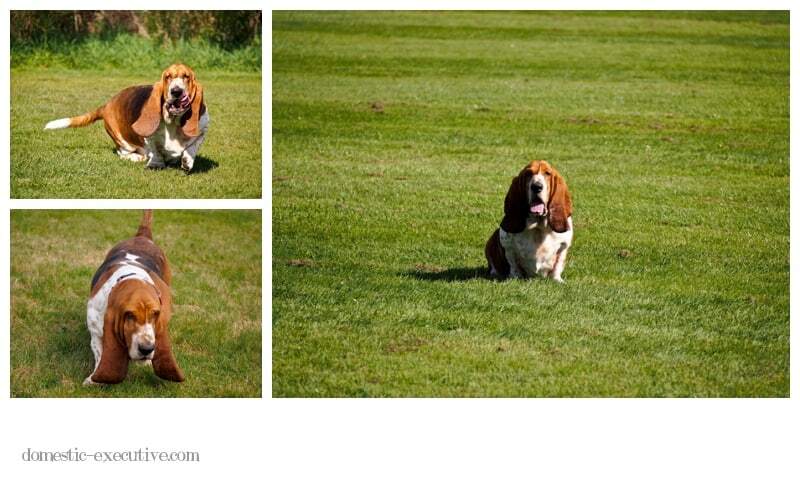 One of the least relaxing things about going on holiday is leaving the bassets at home. I have this constant low-level anxiety about them misbehaving or pining for us, causing untold annoyance or inconvenience to our house sitters. 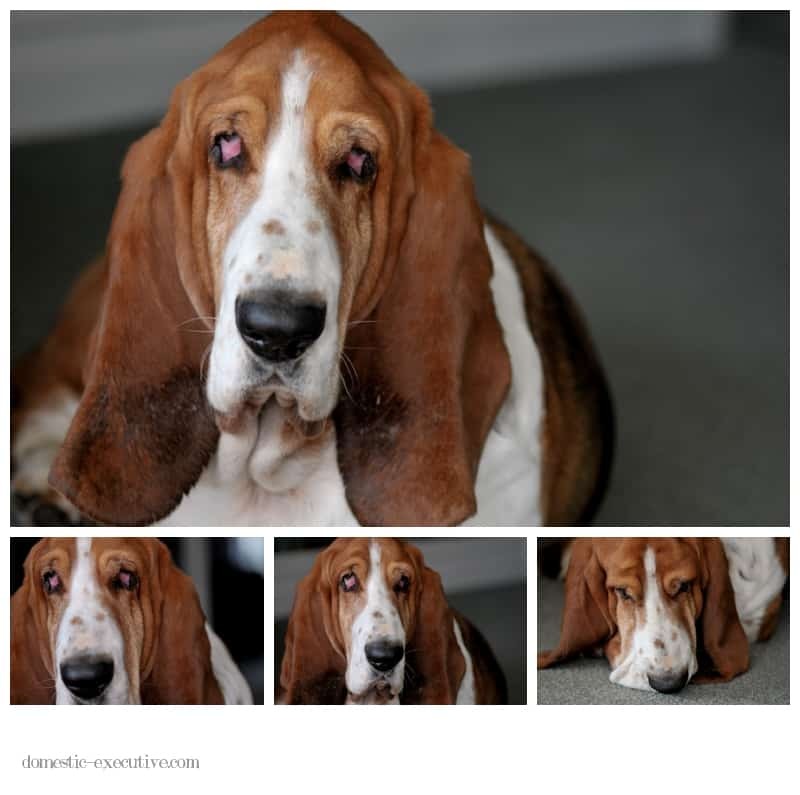 And before you start rolling your eyes and thinking neurotic dog mother, its worth you knowing that just stepping out of a room where the bassets are languishing will before too long result in a deep hoooowwwwwuuuuulllll. 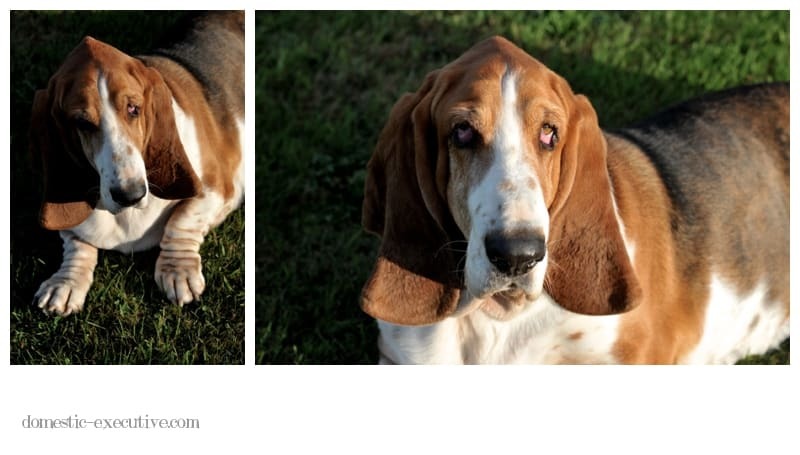 An ear-piercing howling that Little Basset starts closely followed with a deep bass harmony from Big Basset. This might seem like endearing behaviour on a You Tube video but when you live with a few howling episodes a day the sense of fun can get a little lost. I’m anxious that the hounds might start howling and never stop. They are of course resident clowns when we’re gone. Loveable cute adorable hounds eager to please and on good behaviour, so they don’t get sent to bed without any supper. They adjust their affections to please whoever holds the key to the dog food cupboard. Treacherous hounds. There is a fair degree of nonchalant behaviour now we’re back. 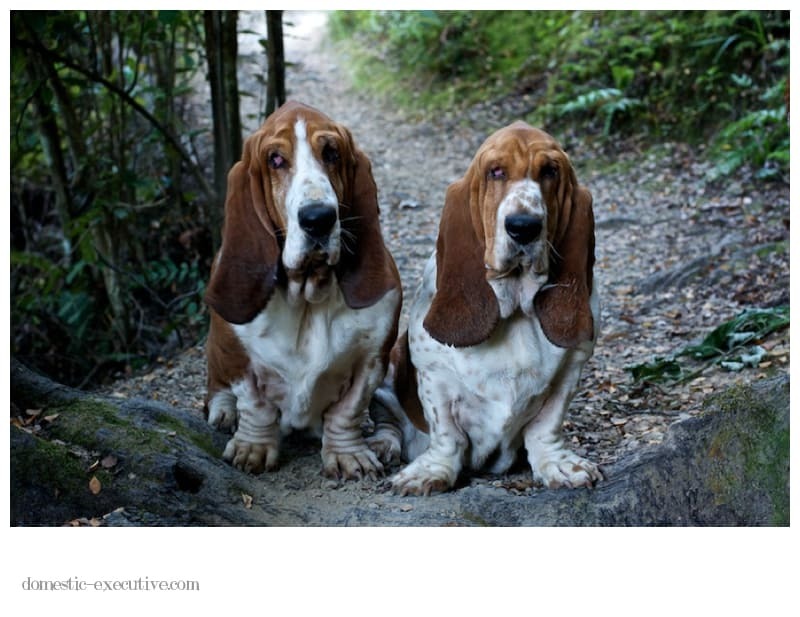 This punishment will last for several days to come but eventually they’ll forget we ever went away and will be back to being our adoring hounds, howling for me as I step out of the room, a vocal sign of their true affections. It would be easy for me to claim a sudden onset of seasonal adjustment disorder for the embarrassingly long time since my last post. Those long sunny days have vanished and replaced by flashes of sunshine mixed with showers and the occasional grey cloud pout. Days are starting later and evenings rush headlong in late afternoon. 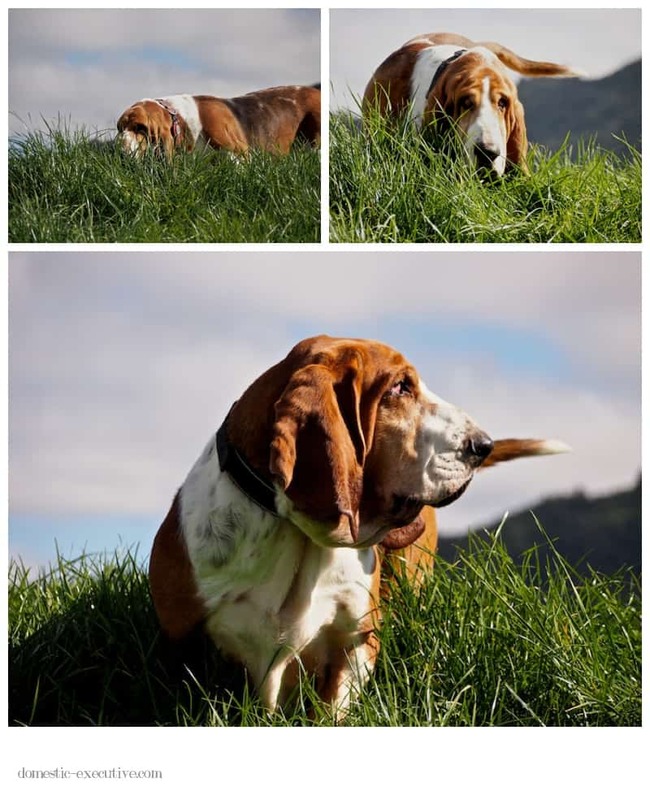 The chickens spend more time doing roost yoga than scratching outdoors and the bassets are perfecting a tight turning circle on the back porch as they get reluctant about stepping off onto the cooler damp grass. But, the change of scene is welcome relief to the garden after such a dry spell. 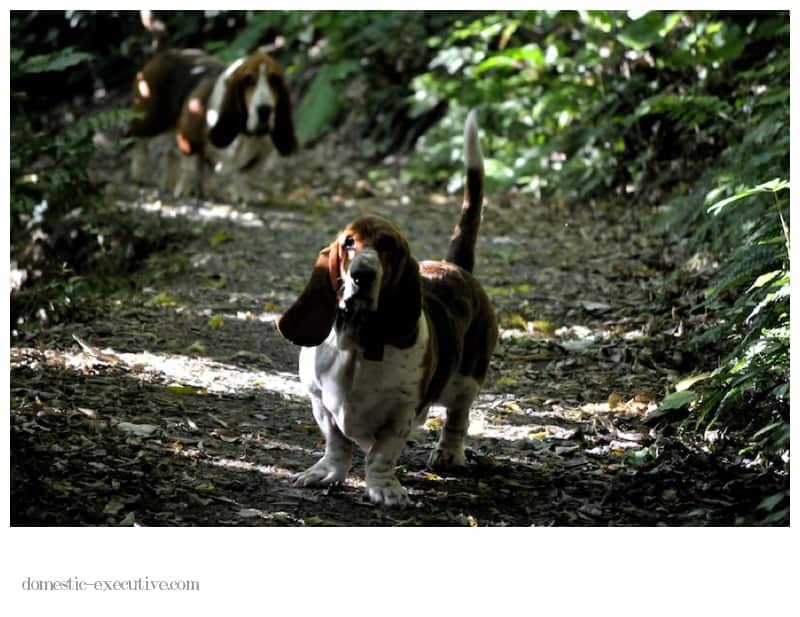 The bassets and I have adjusted our perambulation routine to suit daylight hours and temperature ranges although the hounds walking routine rarely changes much. 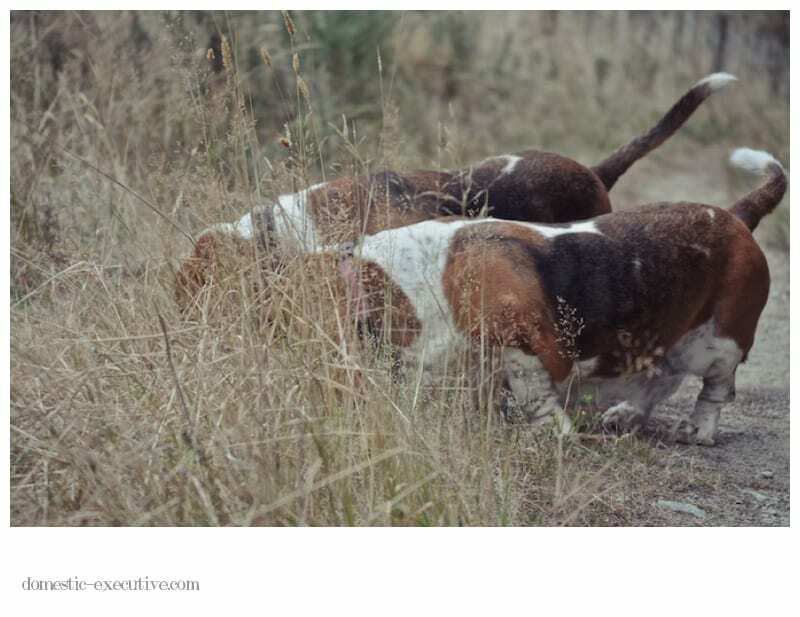 Heads down, sniff along, check out the undergrowth before a final sprint home. These photographs were pulled out for a blog post last week but I got distracted and then myopically focused on an essay on the gastronomy of spices nutmeg and mace pre-1600. 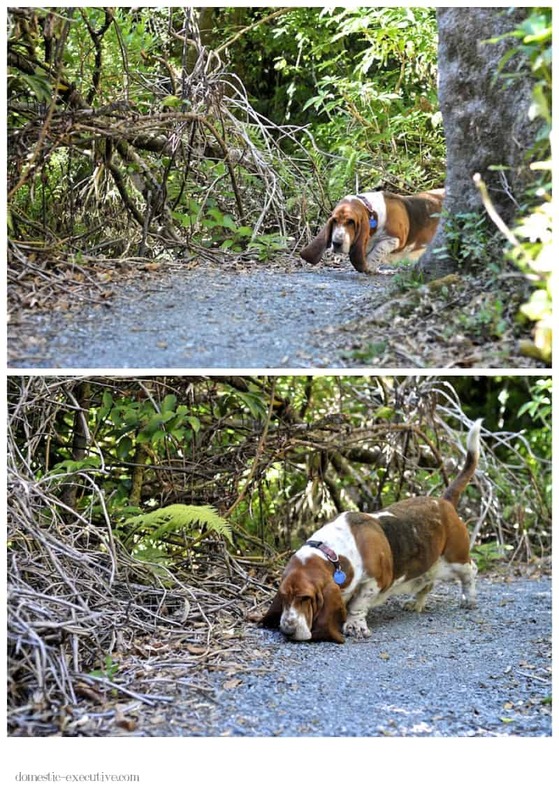 This is just the equivalent of a basset getting lost in the long grass to explore although I draw the line in rolling around is something despicably smelly and unpleasant. I have two more essays to write in the next two weeks then I’ll be done with my first units of studying. Time then to reflect and rebalance on how I seem to once again be trying to pack more into waking hours than it is practically possible. 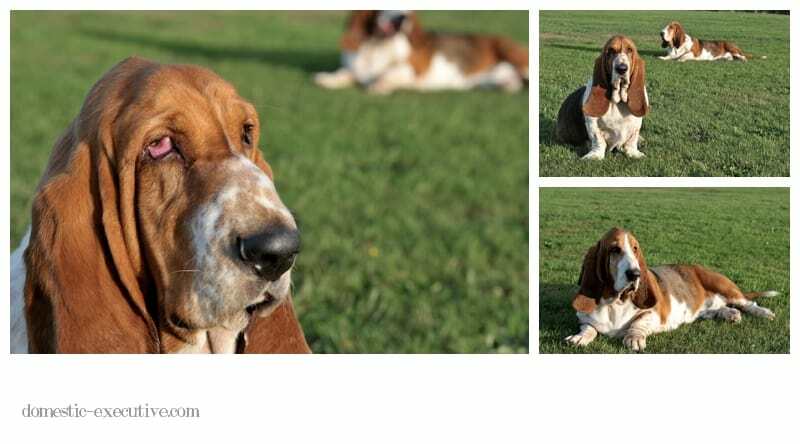 For now though I must get back to following my basset hounds lead. Head down but tail up. When you’re a creature of habit, making change can be a pain, a chore and even a down right bore. 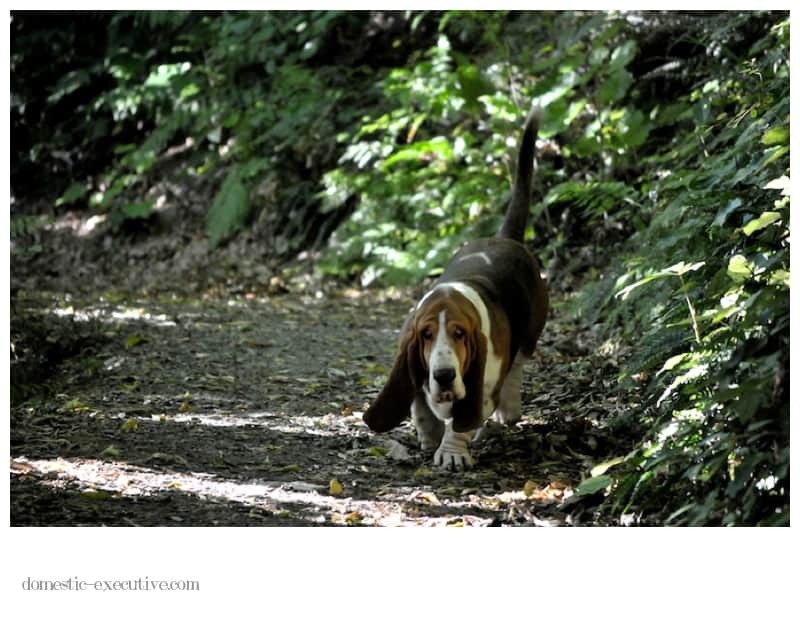 I may have grumbled at the time but restrictions on basset walking forced us to find new walks and in the process we’ve met new dog walking friends. 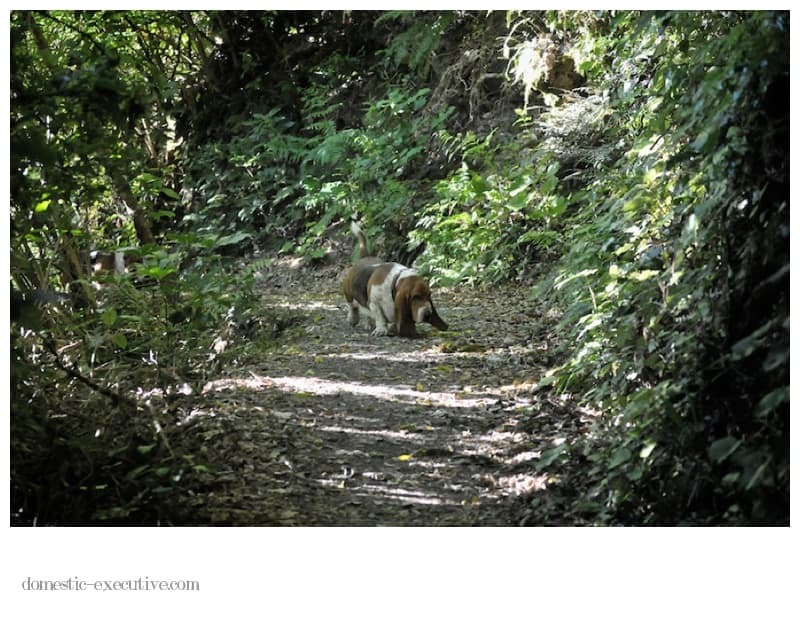 Although it’s not been all bad although we are so pleased to be back along some of our favourite bush walks. There are new smells to explore, old territories to reclaim and brotherly games to play. 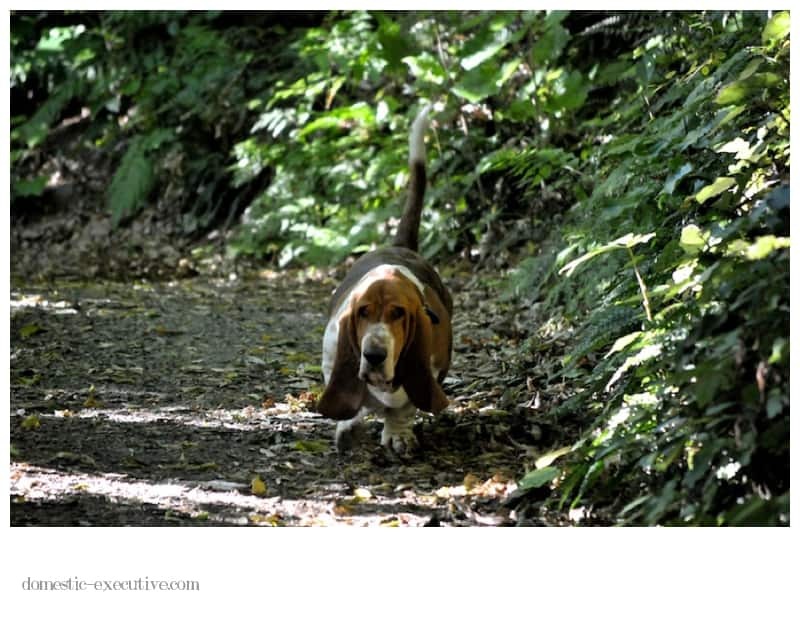 Best of all it means we can get back to some free ranging off lead in safety and the bassets and I can happily walk in peace and harmony. 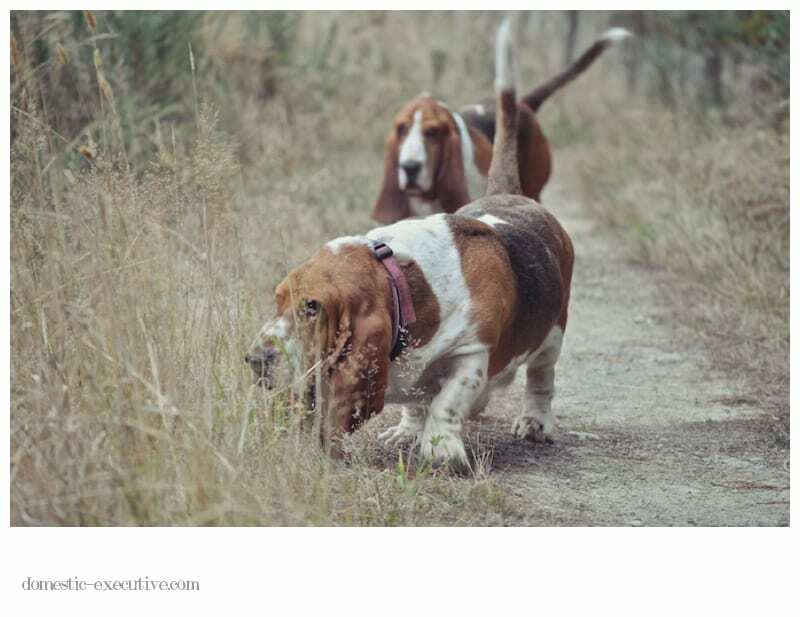 We all have our freedom to explore, me with my camera and the bassets with their noses. Things couldn’t be more perfect. Sometimes I find my ‘failed’ photographs as intriguing as the picture perfect ones. This is Fortnum enjoying his usual leisurely pace. 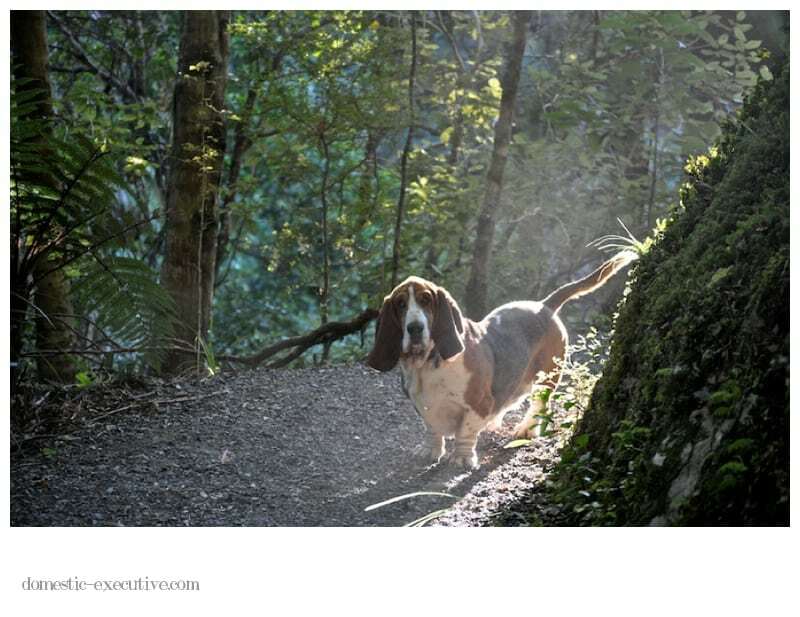 It’s a common misconception that picking up a lead and shouting walkies will bring your dog to paroxysms of excitement. 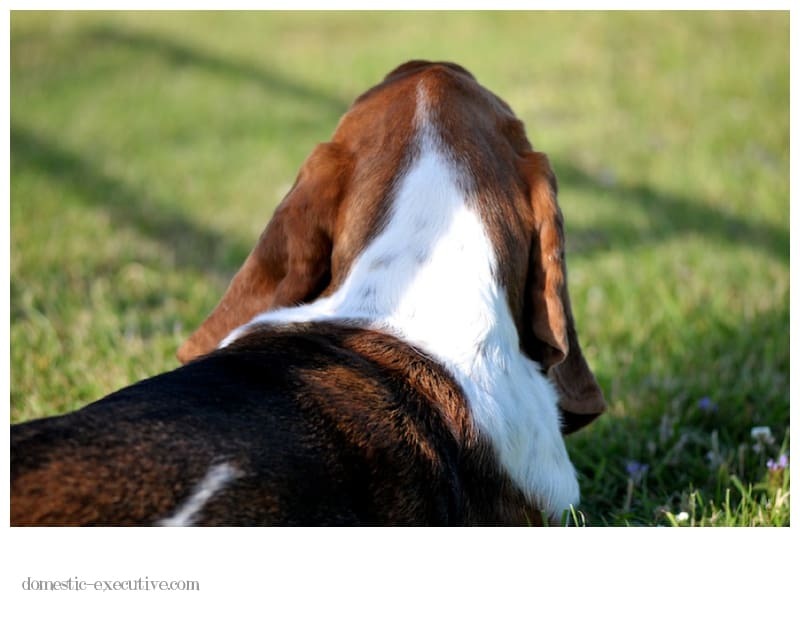 When the leads get picked up in our house the bassets high tail to the nearest soft place to lie flat and engage their gravity inducing powers that make it impossible to move them. I can’t help but wonder what has happened in their upbringing that creates such a daily drama to leaving the house to do something they both love. 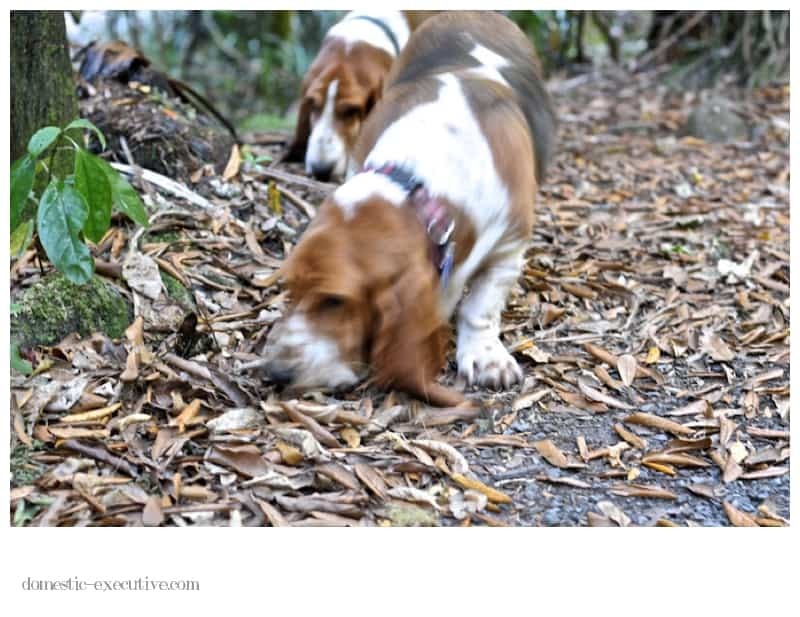 To take a walk, or rather a ramble, through the undergrowth sniffing every scent and leaving their mark just to make sure that every other dog knows that this is their territory is basset heaven. 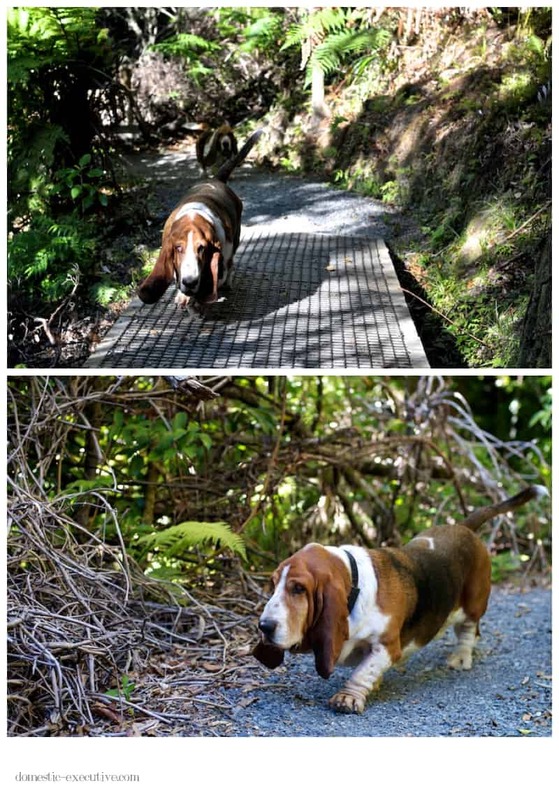 Basset walks are rather more for mental health than physical although the vet declared them fit animals for lazy hounds at their recent annual check-up. 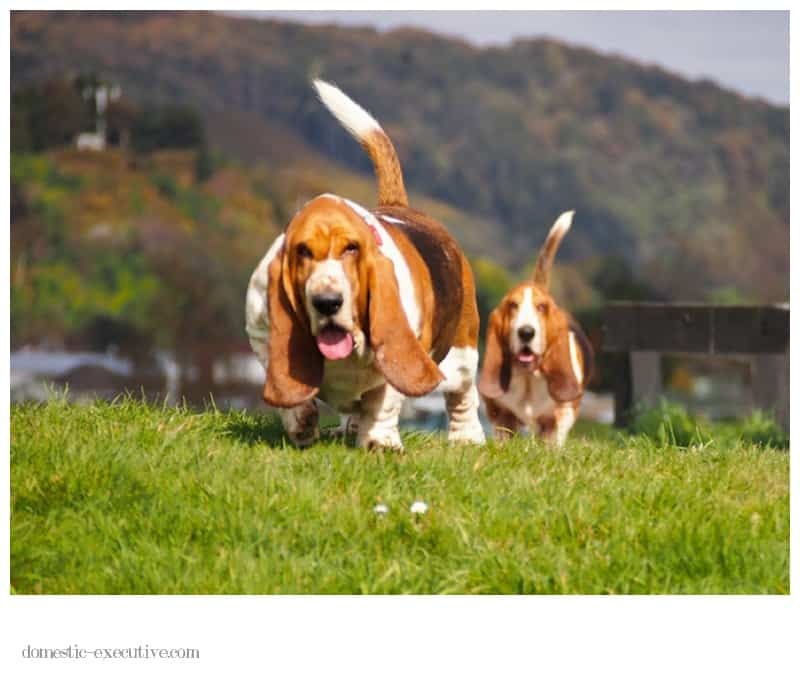 Although the luxury of walks that take as long as they take are gone now I’m back to work, we still walk every day I’m at home and it’s a morning pleasure as long as I give over the time to the bassets who love nothing more than roaming on their own at their own pace doing their own thing. 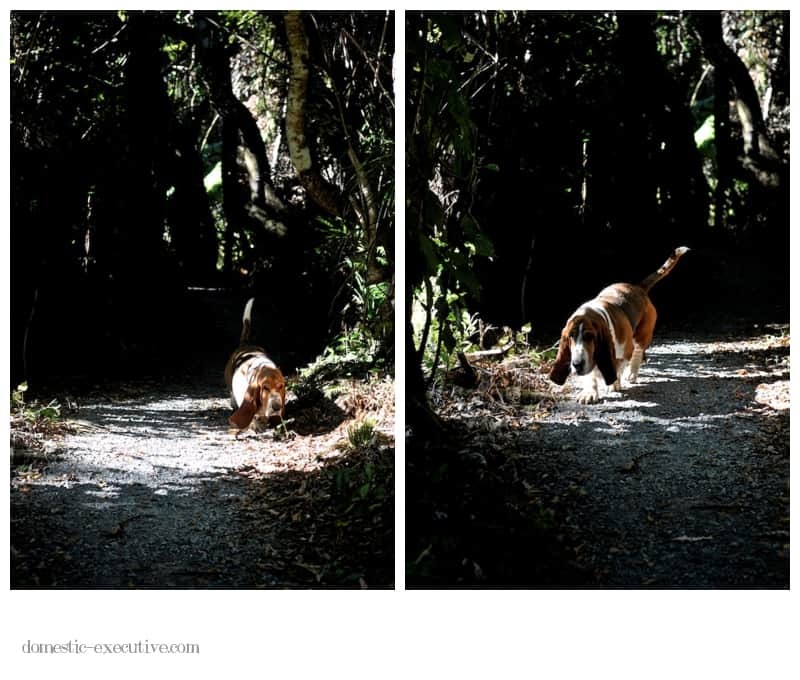 It makes me laugh to watch them wander completely oblivious of me and the camera and then suddenly they’ll look up – first startled and then more inquisitive before quickly feeling secure enough to completely ignore me again. I really wish they could talk although I think their expressions say enough. The days seem packed to the gunnels with work, rest and play. I am loving the studying even if it’s testing my mental agility to its limits and my curiosity means I spend too much time researching and not knuckling down to write the essays. Thankfully the tutor averted a potential stress point on the horizon by granting us all a week’s extension on a large essay due at the same time as two other pieces of assessed work. Can’t help but think some planning and co-ordination might have helped. We’ve had an exceedingly dry spell making gardening hard work although the weeds are enjoying being cemented in the ground. After weeks of baking disasters (how I yearned for some wheat flour) I’ve had some cake and cookie breakthroughs so hope to get back with some food blogging in the next couple of weeks. Summer looks like it might linger for a while which is a wonderful thought. Fortnum and Mason are without doubt brothers who are also best of friends. Siblings who look out for each other and despite the occasional dispute they always turn to each for comfort. 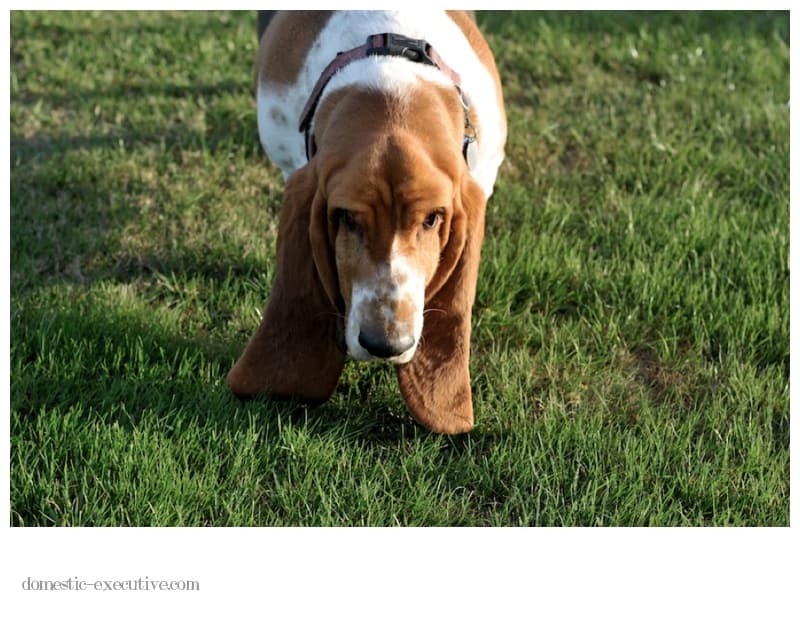 Little Basset is the subservient of the two though doesn’t hesitate to keep Big Basset in line with a bite of the ear and a cross bark when he plays too rough or spoils our walks by dragging his heels. Over the years I’ve noticed how clever each of them tries to be to get what they want – the bone, the lion’s share of their snoozing cushion or the greatest prize of all, the chance to sit with me. Occasionally such sibling rivalry can end in fur fisticuffs followed by a bad case of the canine sulks but mostly they are like two peas in a pod. An inseparable pair never more content to cosy up with each other. Mason loves nothing more than to play manservant to Fortnum by keeping his face clean. I’m not sure Fortnum always appreciates the invasion into his private space but mostly he closes his eyes and enjoys the attentions of his brother’s style canine spa treatment.